Pictured above, from left to right, Gerald Ackerman, director, Office of Rural Health, UNR Med; Dr. Daniel Spogen, chair, Family and Community Medicine, UNR Med; Dr. Scarlett Cavalli Davneshvar, UNR Med Elko Family Medicine resident; Dr. Nittu Singh, UNR Med Elko Family Medicine resident; Walter B. Davis, President/CEO, Nevada Health Centers; Cathy McAdoo, Nevada System of Higher Education regent; UNR Med Dean, Thomas L. Schwenk, M.D. and Delmo Andreozzi, Elko County commissioner. UNR Med photo by Brin Reynolds. Rural Nevadans will have more options and resources for their health care, thanks to a new Elko Family Medicine Residency Program that started this summer. The University of Nevada, Reno School of Medicine (UNR Med) and Nevada Health Centers (NVHC), who are partnering on the residency program to expand health care for local residents, celebrated the grand opening of the Elko Family Medicine Residency Program earlier today. The Elko Family Medicine Residency Program aims to increase the primary care physician workforce in Elko and the surrounding areas, through the training of resident physicians under the supervision of experienced UNR Med faculty physicians. Nevada’s ranking near the bottom of all states in physicians per capita is attributed largely to the critical shortage of graduate medical education (GME) positions in the state. The residency program is an example of a new and expanded training program made possible by a $1.4 million grant from Governor Brian Sandoval’s Task Force on Graduate Medical Education, approved during the 2015 legislative session to address this physician deficit. The program is based within a newly renovated section of the Elko Family Medical and Dental Center at 762 14th Street in Elko, with resident physicians and UNR Med faculty physicians seeing patients as of July 2018. Dr. Daniel Spogen, M.D., chair of UNR Med family and community medicine, and Dr. Richard Williams, M.D., UNR Med residency program director, oversee the Elko Family Medicine Residency Program medical staff, which includes UNR Med clinical faculty Steve Lore, M.D., and Jacqueline Huynh, M.D. The program currently includes four residents in the program, which will expand to six residents in July 2019. It is anticipated that six residents will serve the needs of approximately 6,000 Elko patients. The average resident will see approximately 35 patients per week in the clinic. Nevada Health Centers manages the daily clinic operations. The Elko Family Medicine Residency Program benefits rural Nevadans through comprehensive family medicine outpatient care services. Family medicine is a specialty that is devoted to comprehensive health care for people of all ages. It is a division of primary care that provides continuity of care for all ages, genders and diseases. It emphasizes disease prevention and health promotion for the entire family. Family physicians are the first contact for many patients. Graduate medical education programs play a critical role in training future doctors and are key to addressing Nevada’s physician shortage. According to the Association of American Medical Colleges, data shows a 77 percent likelihood that a medical student who completes medical school and rural residency training in Nevada will remain in the area to practice. 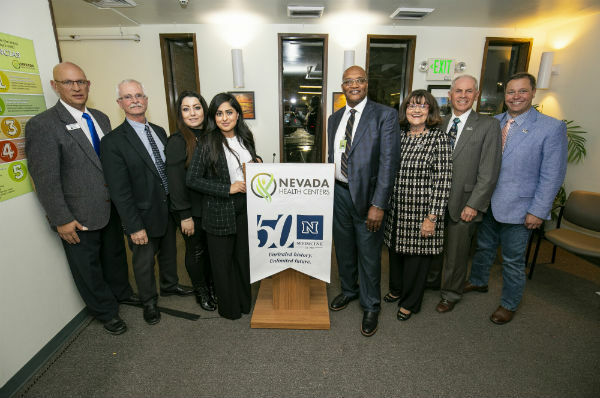 The University of Nevada, Reno School of Medicine, Nevada’s first public medical school, will celebrate 50 years in 2019 and has educated more than 2,200 students, residents and fellows since it was established 1969. The School of Medicine has undergone significant growth to increase the number of health care professionals in Nevada by educating more physician assistants, medical students, residents and fellows. In 2018 alone, UNR Med launched several new departments in Reno, including a department of surgery, Physician Assistant Studies Program and Women’s Health Center. In tandem, Nevada Health Centers has been serving Nevadans since 1977, offering a variety of community-based services such as family medicine, dentistry, pediatrics, behavioral health, and pharmacy at its health centers throughout the Silver State. The organization serves more than 40,000 patients each year and also operates three mobile medical units, the latest of which is a pediatric mobile healthcare unit serving children in the greater Las Vegas area. For information, or to make an appointment at the Elko Family Medicine Residency Program, call 775-738-5850 or 800-787-2568. The program is located at the Elko Family Medical and Dental Center at 762 14th Street Elko, Nevada. Hours are from 7 a.m. to 5 p.m., Monday through Friday.